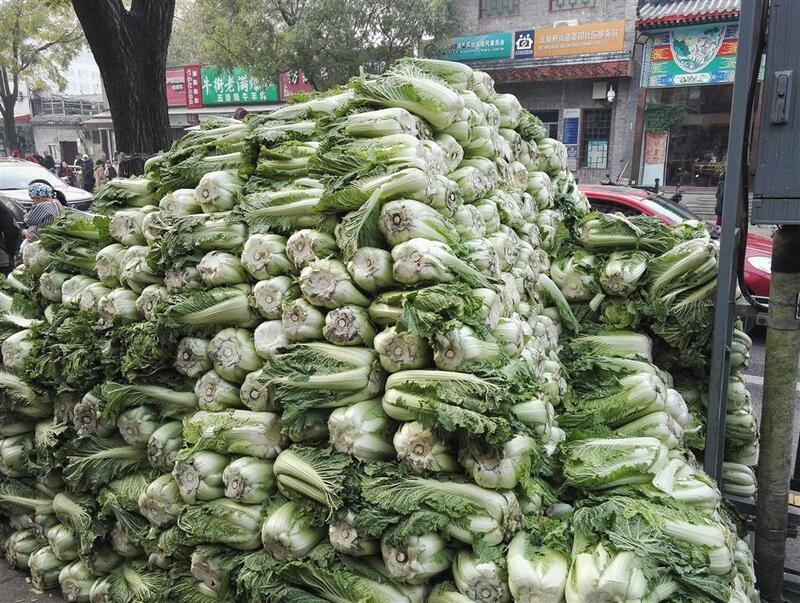 To get through the winter, a typical family in northeastern China can stock over a ton of baicai, the large, leafy Chinese white cabbage. It may sound an unbelievably large amount, but Chinese white cabbage is a rather heavy vegetable, 100 kilograms may be just over a dozen heads of cabbage and a meal for the whole family could use a small one or two thirds of a large one. In the old days, people in the north would also buy over 100 kilograms of white radish, which needed to be buried in soil to preserve them over the long winter. Chinese white cabbage and white radish support people in northern provinces in winter because these two vegetables are easy to store in cold weather. In places where the temperature can drop below zero degree Celsius, the Chinese white cabbage can just be left outside for use at any time. Although modern agriculture can grow different kinds of fresh vegetables throughout the year and stocking a large amount for winter is no longer a necessity, stocking vegetables for winter is a lifestyle that older generations have kept. 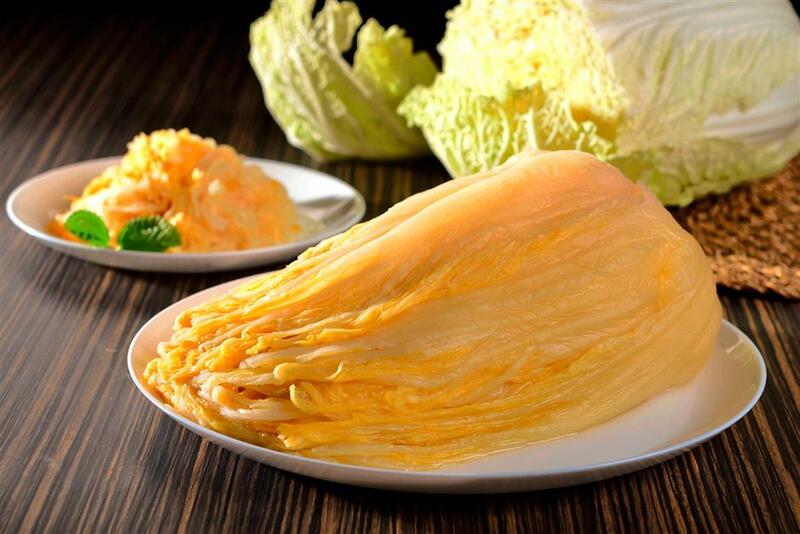 Many families still buy many hundred of kilograms of Chinese white cabbage, because it not only saves the trouble of going out in the cold to buy vegetables every day, but also because there are so many ways to eat it — you won’t be bored by the same flavors over a few months. This week, we take a look at the many ways to make these cheap, ordinary vegetables into something extraordinary. 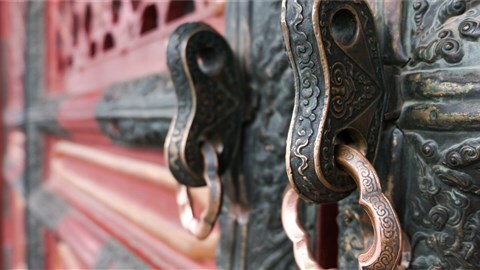 White cabbage is a winter necessity in northern China. White radish, or bailuobo, is a juicy root vegetable that comes in season in the fall and winter. 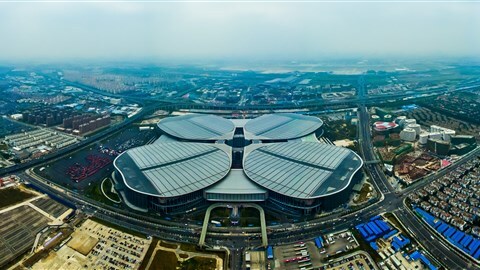 The sweet and juicy vegetable with a hint of spiciness is also known as small ginseng in China because of the health benefits it boasts, especially vitamin C.
There are different kinds of white radish and the more common ones in China are the white and green skinned varieties. The white radish is juicier while the green one feels meatier. 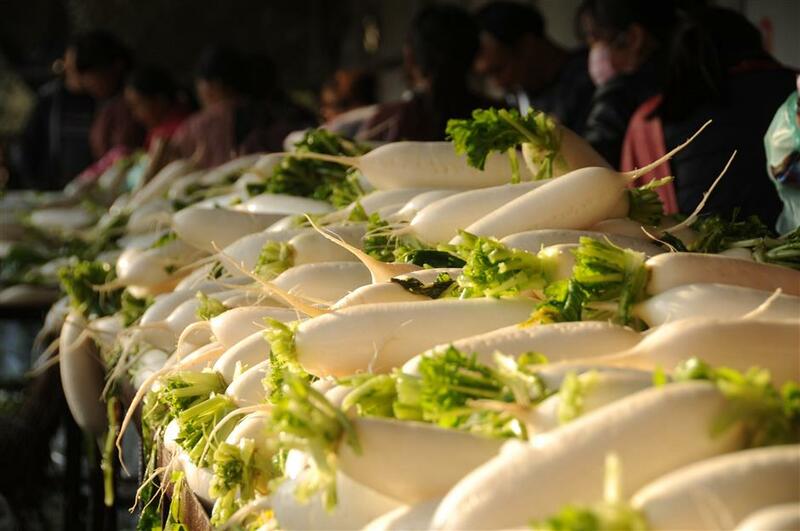 White radish, a winter season vegetable, boasts many health benefits. White radish is great in soups because it can withstand a long cooking time and softens to absorb the delicious flavor of the meat. A winter favorite is white radish and pork short rib soup. 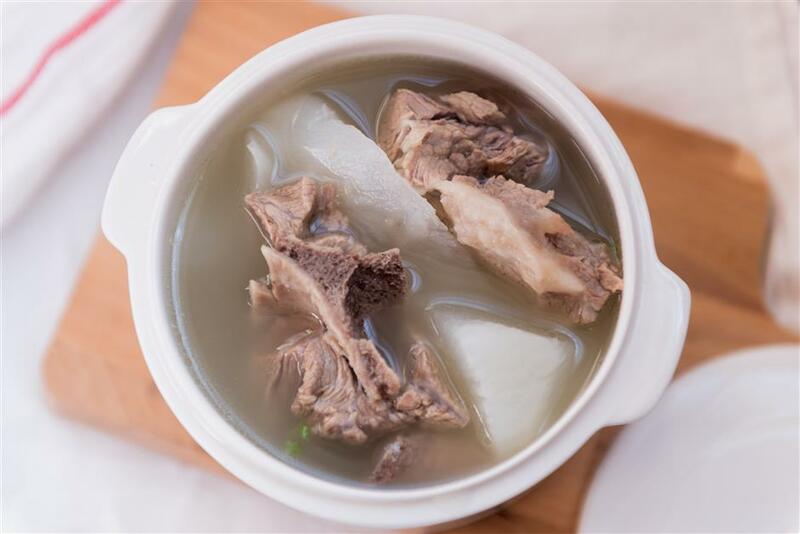 It’s simple to make — put the pork short ribs in cold water and bring to boil, then take them out and stew with thick cuts of white radish until the vegetable turns transparent and soft. The soup doesn’t need heavy seasoning, which can overwhelm the sweetness of the radish. Using ginger is enough to remove the smell of the meat. Goji berries and jujube can also be added to enhance the sweetness of the white radish as well as nutritional value. 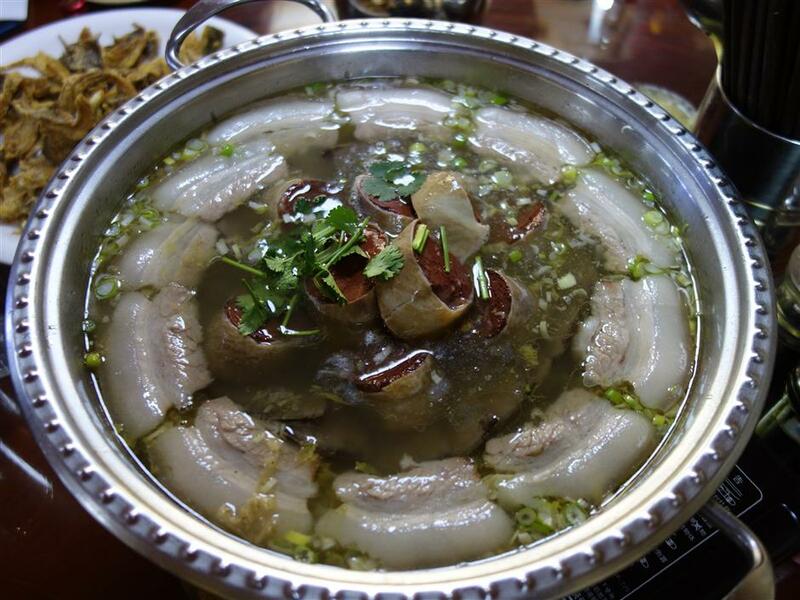 Similarly, white radish and mutton rib soup, radish and pork meatball soup and white radish with tofu soup are very popular. In general, the vegetable can go with any kind of protein, animal or plant. White radish and pork rib soup. If you come across some very high-quality white radish that has a strong, natural sweet flavor, simply slice the white radish thinly and boil in water, adding salt and white peppercorn powder to taste at the last minute. The soup is very warm and appetizing, while you can also eat the radish with a dipping sauce of light soy sauce, vinegar, cilantro or scallion and chili. Green radish can work well in stews and braised dishes. 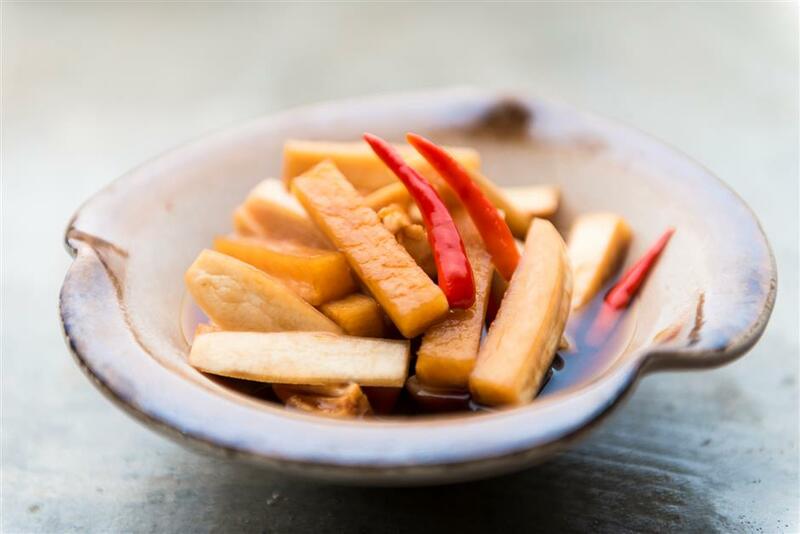 It’s also sweeter, less spicy and can be eaten raw or made into a salad with a classic Chinese dressing of vinegar, soy sauce, sesame oil, sugar and salt. Shredded white radishes can hold on to the flour batter well and they are incorporated in different staple dishes such as radish pancake or youdunzi, a local deep-fried radish cake. 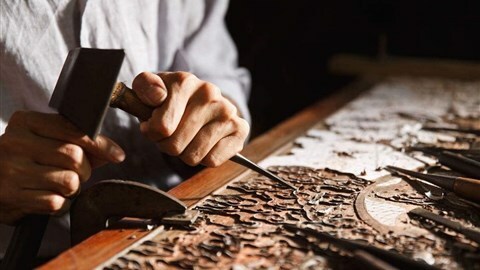 In Henan Province, the shredded white radish is coated with flour and then steamed until soft. The dish is served with a garlic and vinegar-based dressing. 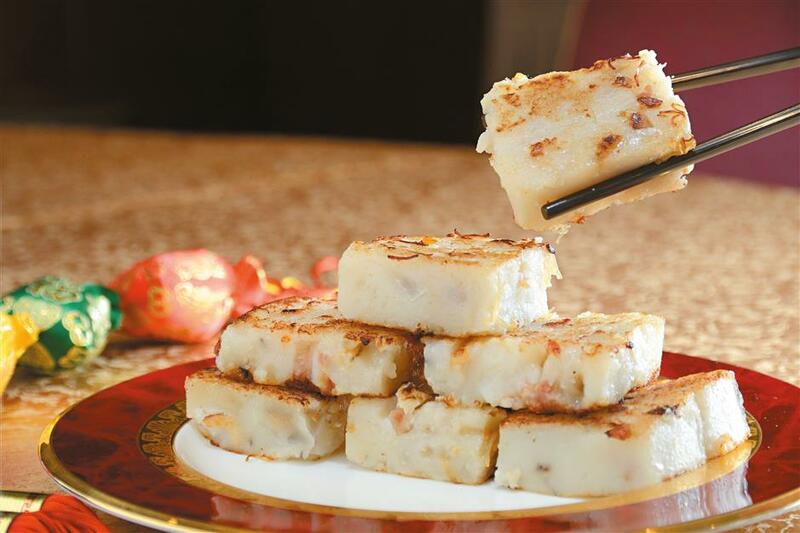 White radish cake is a classic dim sum dish served in most Cantonese restaurants. The soft cakes have a crispy coating on the outside. Another interesting variety of radish is the xinlimei luobo, a sweet pink-fleshed radish with green skin. The sweet and crunchy radish is eaten directly as a fruit or made into salads. To further extend the usage period of white radish, some people would slice up the vegetable and air-dry them. When cooking the dried white radish in braised dishes or stews, the flavor and texture is greatly different from the fresh vegetable. The dried product can also be pickled with salt and chili powder to make a delicious side dish that goes with congee or noodle soup. With its juicy stem and soft leaves, Chinese white cabbage is a versatile vegetable that can do so much in cooking. You can stir-fry it like any other kinds of green leaf vegetable, or stew with rich meats or tofu so the delicious sauce or stock sinks into every bite of the Chinese white cabbage. A quick, classic dish made of Chinese white cabbage is stir-frying the vegetable with vinegar and dried chili. The sour dish can cheer up the appetite. In northeastern China, Chinese white cabbage, pork and sweet potato vermicelli stew is a traditional dish especially fit for winter. It’s simple to make and can be served as a centerpiece dish for the whole family to share with steamed rice. A bite of everything — the rich pork belly meat, soft cabbage and flavorful vermicelli is a remedy to fend off the coldness. White cabbage is used in a lot of luandun, or messy stew dishes since it’s stocked by many families over winter. It’s easily stewed with long beans, eggplants, tomatoes, green peppers and more to make a dish for sharing. A vegetarian recipe is stewing the cabbage with hard tofu in a clay pot. It requires minimum seasoning of ginger and salt to elevate the flavor of two very common ingredients. Fresh Chinese white cabbage leaves can be used as wrappers to make flour-free dumplings. The filling usually consists of shrimp, carrot, corn, shitake mushroom and pork and the dumplings can just be steamed and served. Another reason why some northeastern households stock a very large amount of Chinese white cabbage is that they like to make pickled cabbage, or Chinese sauerkraut. A batch can easily use up a few hundred kilograms of the vegetable. Making pickled cabbage only requires water, salt, cabbage and airtight containers. 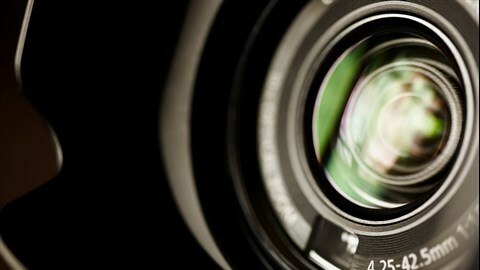 Plastic, clay or porcelain vessels all work well but avoid iron and aluminum containers. The key is to get the right ratio of water, salt and cabbage as well as sealing the container completely. It takes more than 20 days to let fermentation do the job. 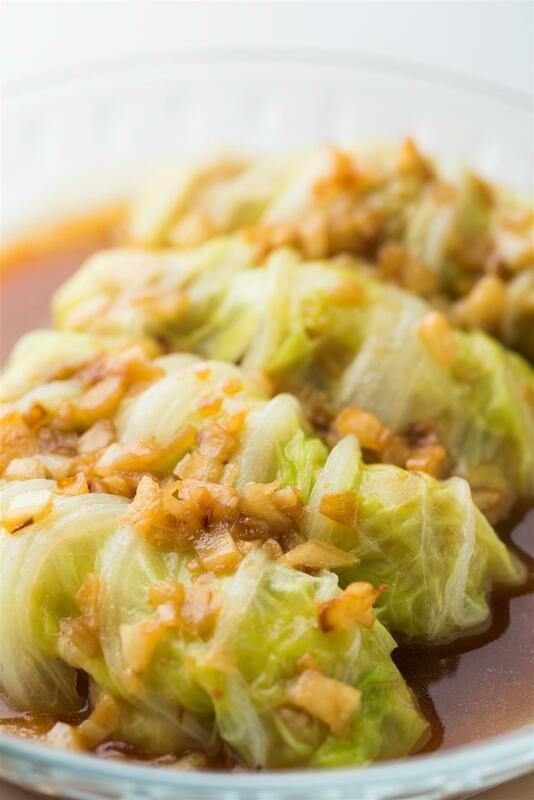 Pickled cabbage is used in stews just as fresh ones, and some classic recipes include pickled cabbage and pork rib, and pickled cabbage and blood sausage. Both fresh and pickled Chinese white cabbage is chopped up and mixed with minced pork to make a filling for dumplings or steamed buns. The cabbage can add some natural sweetness. Although the pickled cabbage is very flavorful, it’s best not to eat too much of it since the pickled products contain nitrite.